Any potential intern or graduate seeking a place on a graduate recruitment scheme will have to learn how to negotiate the dreaded psychometric test, one of the preliminary hurdles in the application process. Candidates are usually asked to take one or more psychometric tests at a fairly early stage in the application process. This is because the tests often prove a stumbling block for potential candidates and therefore they are useful to ‘weed’ out those candidates as soon as possible. Many companies also include more thorough testing procedures at later stages in the recruitment process, for example at assessment centres. There are several different types of testing you may be asked to complete, including numerical reasoning, logical interpretation, verbal reasoning and also personality profiling. Numerical tests are less about testing your mathematical ability, but are more likely to ask you to pull out important data from various sources, such as charts, tables and graphs. 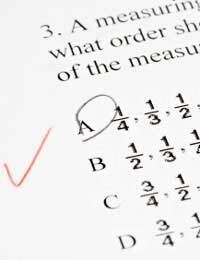 Companies who ask candidates to submit to an online test could be asked all sorts of basic mathematics, although the tests are primarily thereto catch out those applicants who fail to read the questions properly. One of the most different aspects of tests such as these are the time constraints. Online tests do not give candidates the luxury of sitting back and reflecting on their answers and revising them at their leisure. Most usually consist of 30-50 questions that must be completed in usually less than 30 minutes. As a result, speed, but also accuracy is of the essence. For logical interpretation tests, it is highly likely that you will be asked some IQ-test style questions. These usually involve reading a statement and the determining which of the various multiple choice answers you will also be given are most suitable. This is the simplest way to measure a candidates powers of logic and deduction. Verbal reasoning tests are focused on the candidate’s ability to pay attention to detail. Investment companies in particular use them to determine that their potential employees can work well to tight deadlines and can quickly disseminate information. These tests ask the candidates to read a complex or technical piece or written material (standard examples are company reports and annual results, for example), and the candidate will then be expected to discuss the key points they have taken from the material. Of course, the testers are not expecting the candidates to repeat information verbatim or ‘parrot-fashion’. Instead they are designed to evaluate how well candidates can interpret and retain information whilst under pressure, as well as being able to relay the key points and trends of the information to a third party. The businesses that use psychometric tests for potential candidates claim that there are no wrong answers when it comes to establishing a person’s psychometric profile. Instead, the tests are trying to establish which particular personality type the candidate falls into. The company can then use this information to try to match the candidates they think will be successful to roles where their personalities will be advantageous. Can you Beat the Tests? There are no tips or cheats that can help a potential job candidate to pass psychometric tests, as there’s no real way to measure what constitutes a pass or a fail. Practice can certainly help, however, although the real key to ensuring that you perform to your full potential is to make sure that you take time to read any questions carefully and get straight in your mind what is being asked of you before making a start on finding the answer. Good luck!